Emil Friis is a solo musician from Copenhagen, Denmark. He started out wanting to be a filmmaker, but states that, “For some reason which I’m still not quite sure of, I started writing songs”. I came across his music while watching a fashion promo, and was completely drawn to the very atmospheric and filmic sound. The track’s called Sand In Your Eyes and there’s a video that’s been made for it, which in my opinion is very well executed. He’s released three albums which you can stream here. He also has a bunch of recordings on his Soundcloud. I’d recommend checking out a track called The Man In The Wind which sounds like it was recorded in a bar – it’s a good’n. My introduction to Andrew Bird was while browsing the shelves of the small and rather wonderful record store People Independent Music of Guildford, Surrey. A superb Indie store packed with a range of genres and always something interesting or new, if you’re ever in the area check it out, it’s well worth a look. So, I’m standing there, browsing the Alternative/Indie section, I have one CD in hand, probably all I’m going to spend today and then this song kicks up, it’s beautiful, it reminds me of the Fleet Foxes, with a little Ryan Adams, but with a whole lot of violin and a little more subtlety, it’s sort of quirky as well. 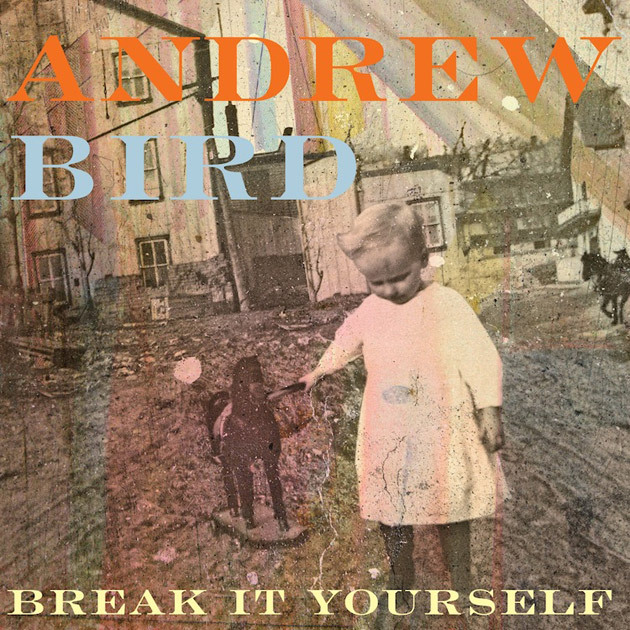 The guy next to me leans over to the counter and asks “Who is this?”, to which the girl replies with a smile “It’s Andrew Bird’s new album”, “Hmm…” the customer ponders for all of half a second, “I’ll take one!”. Handing the CD over in my hand to pay I echo, “You know what, I’ll take one as well”. It was one of those moments I had to hear more on my own stereo, if I hadn’t bought that album there and then I’d be a mug. That’s a great start, first track of the new album and I’m totally sold, as was my fellow customer. I’m happy to report Break It Yourself delivers. I’d heard Birds name thrown around before, I’d heard his outstanding whistling skills (seriously, check it out – this song also features on this album), but never taken the time to check out his music properly. I was pleasantly surprised to find a sound that mixes beautiful strings with soft guitars and rock elements, arranged with just enough oddities to keep it fresh. It straddles modern acoustic songwriting and traditional folk music pretty comfortably and never feels like an unnatural or forced combination. Desperation Breeds elevates itself to one of my favourite album openers of the year beginning slow and brooding before bursting into life with beautiful flourishes of violin. These frequent the album and compliment most songs bringing the music alive with a bright and vibrant feel. The aforementioned whistling is there and is as excellent as ever, Bird really does have some skills and no matter what he is playing it all comes together so perfectly well with a natural and effortless flow. The short recording window and live studio recording only helps to give the album the organic, natural sound is presents. Pacing is graceful and mixes the uplifting with the more gentle mellow tracks. The only complaints I have are aimed at the latter half which drags slightly before soaring again with the absolutely superb Hole in the Ocean Floor. It never becomes wearisome however and overall it can be taken as a very well rounded full-length. It’s worth keeping in mind that this is my first Andrew Bird album so I cannot compare it to previous releases, but it’s definitely a great place to start and I can safely say I’ve come away a fan. Andrew lacks a website at the moment but check him out on facebook if you want to keep up with news and tour info. I wouldn’t usually post a call to arms (wallets) like this but Grails are in desperate need of the fans help this week, and being one of my favourite bands this is the least we can do. To summarise the situation, a hard-drive containing “1000s of hours of work for all 3 bands we produce, not all Grails, but it immediately impacts Black Tar [prophecies] 5, half of the next Lilacs & Champagne record is on there and probably towards 3 HolySons records…” has died and the band are planning to send it to Drive Savers in order to, hopefully, rescue the contents! number one – an open donation which can be any amount. number two, for $15 – five unreleased live tracks. These are culled from the best live moments that we could find in the archives from the early days..
Grails will reply with a link to download within 24 hrs. and finally, number three, for $30 – Your choice of the LP’s they have in stock: Burden of Hope, Redlight, Important Records 300th release compilation, or Lilacs & Champagne. Personally I went with number two, the unreleased live tracks. It’s worth mentioning the Lilacs & Champagne album that was released earlier this month was outstanding and the follow up is hanging in the balance right now, so if like me you care about Grails future music please consider helping them out!